Congratulations! You just got some media coverage. There you are in the press or on someone’s blog. You’ve been mentioned. It feels great doesn’t it? How do I get more value from media coverage? Here is a quick guide for maximizing the value of media coverage in all of those ways, in 21 steps. Journalists are now expected to drive traffic to their articles. They are judged on this. Maximizing traffic to the piece is a nice way to say thanks and a great way to help your new friend succeed at their job. You want their article to be the traffic hit for the week. Here’s how to make this happen. This is the first, easiest and most important step, so we’re going to spend extra time on it. This is important. Our goal is to share it many times on many networks. When you share it on social media, mention the writer. Giving them credit …and thanks. 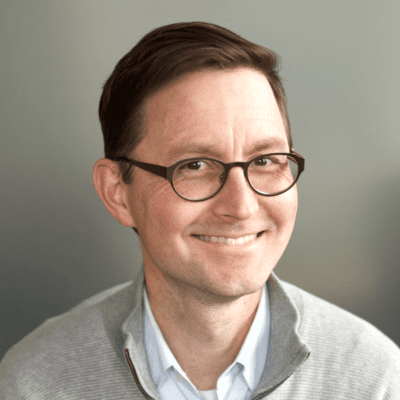 Here’s how I thanked Alex Rynne for including me in a post on the LinkedIn blog. Now, share it again and mention the publication. 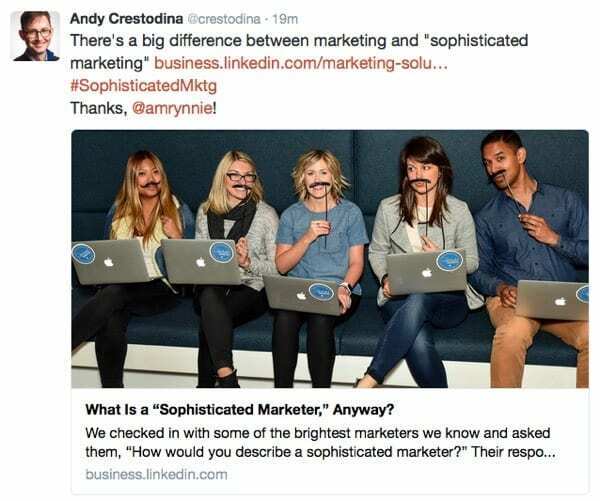 This will get the attention of the marketers at the brand, thanking them …and giving them the chance to reshare it. Next, if anyone else is mentioned in the article, include them in the next share. This will bring it to their attention and might enlist their help in sharing and driving more traffic. And of course, use hashtags, questions, numbers and any other trick to drive reshares and clicks! 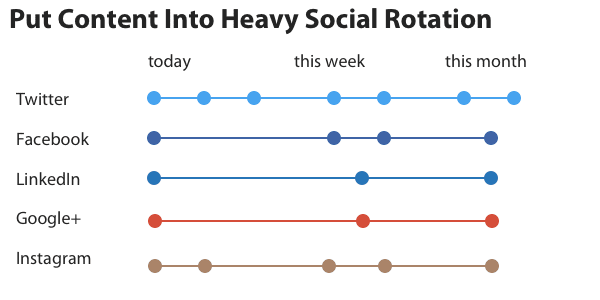 You can set up all of these shares at once using social scheduling, or set these up using social media automation. 2. Find other people who shared it. Share it again, thanking them. Now you’re looking at a list of everyone who shared the article on Twitter. You can sort them by the size of their following or their likelihood to retweet. Next, share the article again and mention them. If they look like a blogger, journalist or editor, we’ll want to take extra steps to connect with them. Those tips are coming soon. If the story appears in the Twitter, Facebook or LinkedIn accounts for the publisher, be sure to like, comment, share and retweet it. 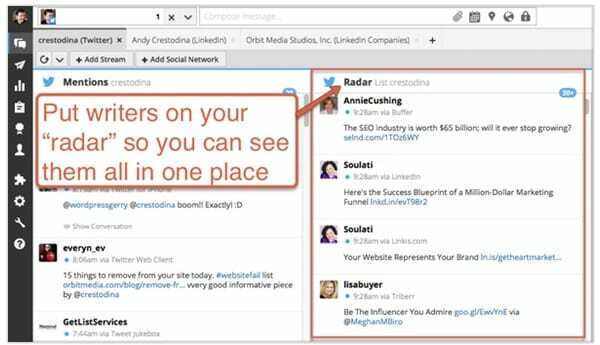 This will further expand the reach and show the writer that you’re paying attention and helping to promote, especially if you mention them again. If you have a list and your email strategy has room for it, add the article to your next email. After the email goes out, make sure to forward a copy to the writer, letting them know that you shared the article with your list. Depending on the topic of the article, it may be perfectly natural to link to the media mention from a page or post on your site. 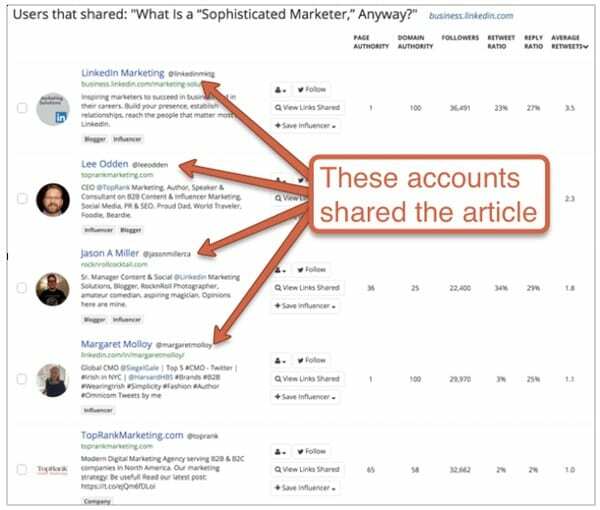 When you add the link, consider mentioning the article and the publication. Then (of course) share the page with them, letting them know that you’re doing everything possible to drive traffic their way. Are you active in any LinkedIn or Facebook groups? Do you ever answer questions on Quora? These are all places where you can drop in a link to the article. If possible, mention the writer. 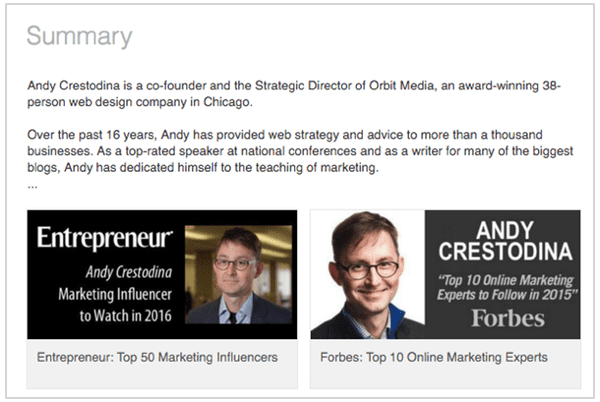 Now that it’s obvious that you’ll do anything possible to drive traffic to any piece that you’re mentioned in, you are much more likely to be mentioned again. But it’s still important to follow up and build a stronger connection with the writer. It’s time for some networking. Now we’ll use the media coverage to grow relationships, starting with the blogger or journalist who wrote the piece. It’s the forgotten inbox. 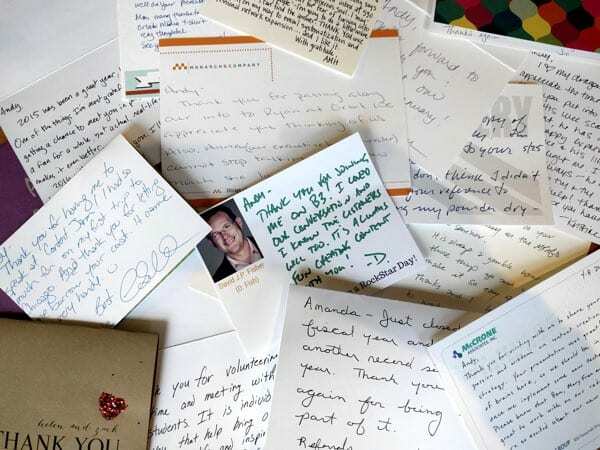 Putting your handwritten thank you message in their mailbox immediately separates yourself from 99% of other marketers. Just get out a pen, write something thoughtful and add a stamp. Next, have a few friends or superfans send a quick note to the writer. This will be unexpected surprise. It shows that you have connections who are paying attention. It’s also a good way to connect good people who may be valuable connections for each other. If you haven’t yet, make sure to send a quick LinkedIn connection request. The request itself can be another thank you message. Another way to keep better track of the writer (and all other writers you know) in social media is to add them to Twitter lists and Facebook groups. Do you have your own event? If so, invite the writer to attend. This will build a better connection, and it might lead to a bit of press for your event. Inviting writers it a great way to promote events. Are you going to an upcoming event? If so, invite the writer to go with you. Maybe you can meet up for coffee beforehand or a beer after. Inviting others is a great way to get more from an event. Now we go beyond the original writer, to other bloggers and members of the press. They may be interested in writing something similar for their audience or consider you as a source for another topic. …when you share it with them, mention how well it performed, including the number of shares. Bloggers who write roundups are always looking for something to include. If the article seems to fit within their content strategy, send a quick message suggesting they include it. If there are leads already in your pipeline, you may be looking for reasons to reach out to them. A press mention is a perfect reason to do that. If there are companies that you’d like to connect with, a press mention is a good way to reach out. Just find the relevant person on LinkedIn, or ask a mutual connection for an introduction. A short, simple email with a link to the article is a smart way to get on someone’s radar and build your credibility. Pro Tip! This is sales activity in a world of crowded inboxes. The article is really just your reason to reach out. But if you want to know if they clicked the link or not, use a URL shortener like bit.ly. This way you can track the link. If clicks = 0, they didn’t read it. If clicks = 1, they did! 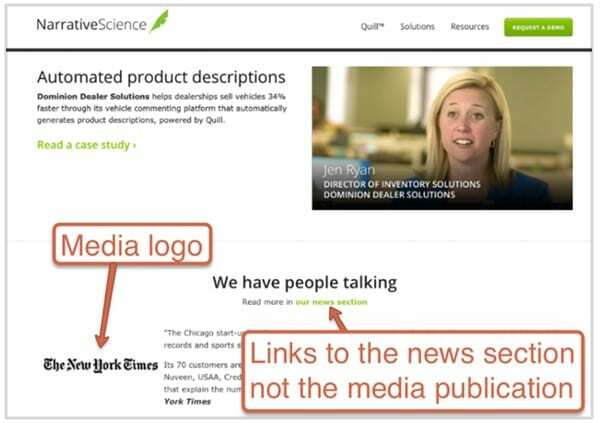 If the media mention links to any page on your website, you just had a great day for SEO. Links to your website are authority. And authority increases the likelihood that anything on your domain will rank. This is why PR professionals have such a huge ability to affect search rankings. The key is to understand the value of links and capture the opportunities of press mentions. Note: The specific value of the link from a page is equal to the “page authority” of that page. But for now, let’s keep things simple and focus on Domain Authority. Here is a complete explanation of how Domain and Page Authority works. Every link matters, but links to your site from high authority sites matter much, much more. As a general rule, you should actively try to win mentions (and links) from any site with higher Domain Authority than your website. 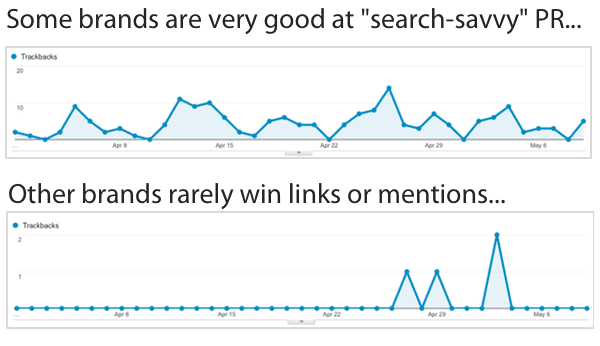 If you are serious about your search rankings, you should be active enough in PR to get mentions and links to your website on a regular basis. When you understand the value of these links, and their impact on search rankings, you look at media coverage differently. You never want to miss the chance to get linked or mentioned. Eventually, you look at your PR differently, and you actively create content that is worthy of press and links. If you’ve been mentioned by the press and that mention didn’t include a link. Look for ways to reach out and politely ask that the publication link back to you. If they do, celebrate. If not, move on! Months or years from now, it will be hard to remember what caused the traffic bump. Or even days from now, someone on your team might ask about that spike in traffic. Adding a note into Analytics will help. Annotations are tiny notes that appear under the timeline in Analytics reports. You can add them by clicking the tiny gray triangular arrow below the timeline on any report. Now you can type in a note associated with any day. When you do, start the note with “press” or something similar, to quickly differentiate it from annotations about other things, such as newsletters or website changes. The final checklist of things to do after you get press is all about trust. The “halo effect” is a bias that we all have built into our brains. When you see the logo of a credible brand, such as a news publication on a website, the website looks more credible. If the publication is a well-known brand, take a minute to add the logo to your home page. It doesn’t have to link to the article. In fact, it’s better if it doesn’t, since you don’t want your visitors to leave your website. Here again, you don’t really want to send visitors away from your site. To keep your visitors from leaving, write a summary of the article as a news story, using excerpts. At the bottom, you can link to the press piece, but ideally, you’ve explained the article in such detail already, your visitors won’t really have a reason to click. Any quote from the article will make for a great blurb. It adds trust and credibility since the name of the publication will appear right next to the blurb. It can look like (and work just as well) as a testimonial. A short list of all the places you’ve been mentioned can be added to the summary of your LinkedIn profile. These can appear as text, or you can make them more visual. Create a small graphic, showing the name of the publication and the title of the article. This can be added as “media” to your summary. The dimensions are 280px by 135px. See those little pictures at the bottom of my LinkedIn summary? Yup. I made those myself! Companies are probably already contacting you, asking if you want to buy a mounted plaque. It’s a business. But if you have a physical space with a welcoming lobby area, hanging that plaque can build trust in your brand with anyone who walks through the door. Any other ideas on things to do maximize attention from the press? We’d like to keep this article updated. Leave a comment with any more tips and help make this a better article. Or share any other thoughts or questions! So good, so fun, so practical. I’m sending this to clients, students, ASAP. Sharing with a colleague who had some awesome media coverage last week. Hope to put these tips into play for myself before too long! Great to see my smiling mug on your stack of thank you notes! And it’s quite telling how many notes you do have – you’re always sharing some great knowledge. Thanks! This set of suggestions is really, really good. Covered all the bases, and then some. Most companies don’t appreciate the brief shelf-life of a hit and how long it sometimes takes to get the next one. This is a great reminder that you can amplify (milk?) 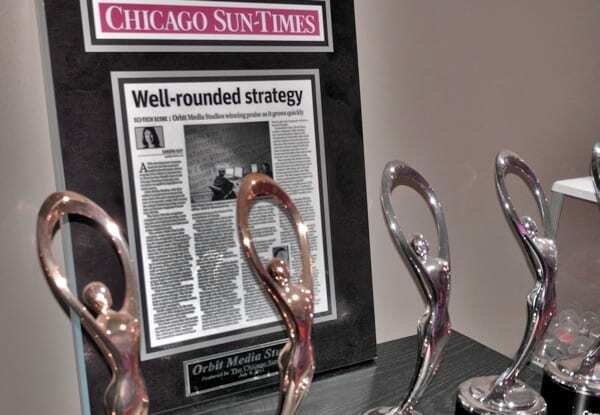 a placement in many different ways for wider reach — certainly go beyond the pre-digital era when we relied on photocopies, clip books, a few plaques and a kind word from mom. Extremely “share worthy” but I was really intimidated at first by the high count of “ways” topping out at 21. Any anecdotes on which ones or combination of them move the needle greater? Hi Andy, I just stumbled on your blog and like it a lot. Thank you for the great resource, Andy! Have used this resource twice so far with our good fortune.